Do you know any of the people in this image? Black and white negative showing officials at the May Day ceremony at Ontario Ladies' College. 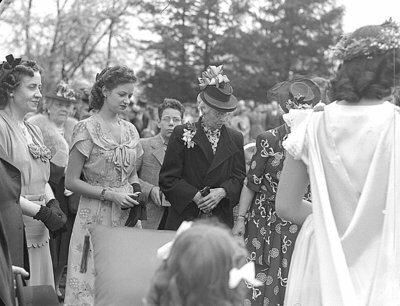 The May Queen for 1946 was Darlene Cornell and her back is to the camera at the far right. The students at Ontario Ladies' College participated in May Day celebrations every year. May Day Celebrations, 1946, Marjorie Ruddy, Whitby Archives, 23-000-408.